President Trump wants a new trade deal with Mexico. Mexico's message: Let's get it done soon before it's too late. 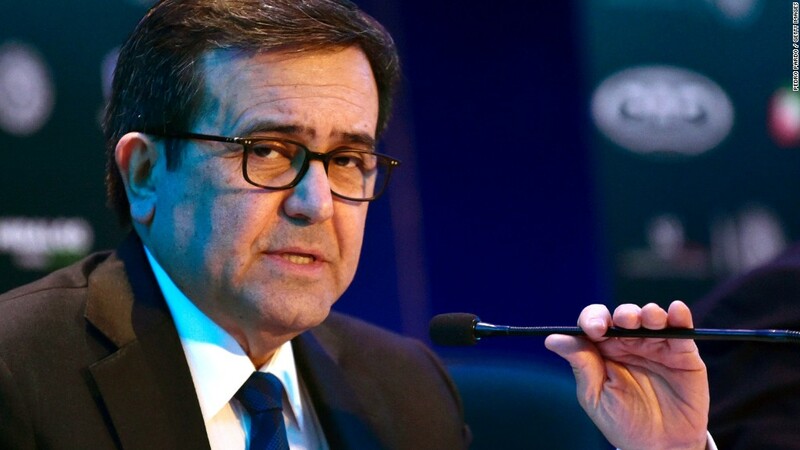 "It will be in the best advantage of the countries involved that we finish this negotiation within the context of this year," Mexico's economy secretary Ildefonso Guajardo told CNNMoney Thursday evening at the World Economic Forum in Buenos Aires, Argentina. Why this year? Mexico is scheduled to hold presidential elections in July 2018, and Guajardo's boss, President Enrique Peña Nieto, can't run again because of term limits. There's no guarantee the next administration in Mexico will come to the negotiating table. Related: Mexico takes step to pivot away from the U.S.
Guajardo, who is one of the chief negotiators on NAFTA for Mexico, was echoing comments made by his American counterpart, U.S. commerce secretary Wilbur Ross, who said he hopes to start the process of trade talks before Congress' spring recess begins April 10. Guajardo drilled the point home, arguing it'd be hard to ratify a deal by mid-2018. "Whatever I negotiate, nobody will be able to make sure we deliver, because you don't know the outcome of the elections," Guajardo said. "Incentives are there for us to really set an objective of negotiation -- the latest by the end of 2017." Time isn't on anyone's side, and that's a problem for Mexico. There are major concerns that the uncertainty hanging over its economy will cause foreign investors to pull their money out of Mexico. However, there is a formal process that involves any NAFTA negotiations. Just to get to the table, Ross must go through a check list of items. He has to send a letter to Congress formally announcing the Trump administration's desire to renegotiate NAFTA, the free trade deal with Canada and Mexico. That announcement will kick off a 90-day consultation period. Only after those 90 days are over can the U.S., Mexico and Canada sit down for talks. Guajardo says the earliest that talks can take place would be the end of July. But Mexico and the U.S. are a little at odds over the details of the negotiations. Ross said at a press conference in Washington with Guajardo in March that the U.S. might renegotiate separately with each of the countries: Canada and Mexico. Guajardo staunchly opposes that approach. He wants all parties at the table. "In trade, the only thing that makes sense is a trilateral negotiation," says Guajardo, meaning all three countries. Trump blames NAFTA for a flood of manufacturing jobs moving to Mexico, labeling it a "one-sided deal." He has threatened tariffs against Mexican imports into the U.S.
Guajardo said Thursday the mere threat of tariffs from the U.S. risked opening a "Pandora's box." He argues that lobbyists in Mexico would urge him to strike back against major U.S. exports to Mexico like apples and corn. Before NAFTA, those products faced tariffs. Today they travel tax-free across borders. "I'm sure the apple guys from Washington state or the corn guy from Iowa will not like tariffs on corn or apples," says Guajardo. "It's not in the best interest, neither of the United States nor Mexico, to reintroduce tariffs." Guajardo has defended NAFTA in the face of Trump's strong criticism. He never foresaw having to defend NAFTA's very existence. "Not even as of last year I thought I would be in this situation today," says Guajardo. "Every challenge has the opportunity to convert into a winning proposition."